The city’s art community kicked off the sixth annual Paterson Artwalk, the largest artistic event in northern New Jersey, on Saturday morning. The two-day event includes seven different venues throughout the city’s art corridor which starts from Spruces Street, encompasses the very tip of McBride Avenue on Mill Street, and ends by climbing on to the lower half of Totowa Avenue. First stop in the walk is the Art Factory, a colossal former mill building, where hundreds of artists setup exhibitions for the public to see. Among them a Montclair photographer, Jay Seldin (pictured), a Marco Polo type, who has traveled three continents capturing the way people live. 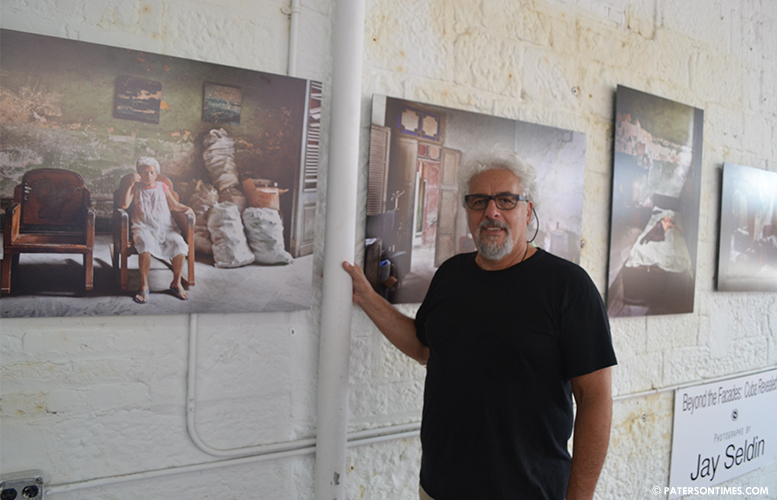 Seldin displayed his exhibition, “Beyond the Facade: Cuba Revealed,” in the second floor of the mill building. “We go all over the place, I just came back from Myanmar,” said Seldin. Since 2008, Seldin has been working on a project in Cuba. He and a trusted Cuban guide would knock on doors in Havana, without any pre-arrangement, and visit homes to capture life as it is lived in the fabled city less than 250 miles from Miami. The Cuban subject of Jay Seldin’s photography. “Where do you really get to meet people? This is where you meet people at their homes,” said Seldin pointing to a photograph in his exhibit. 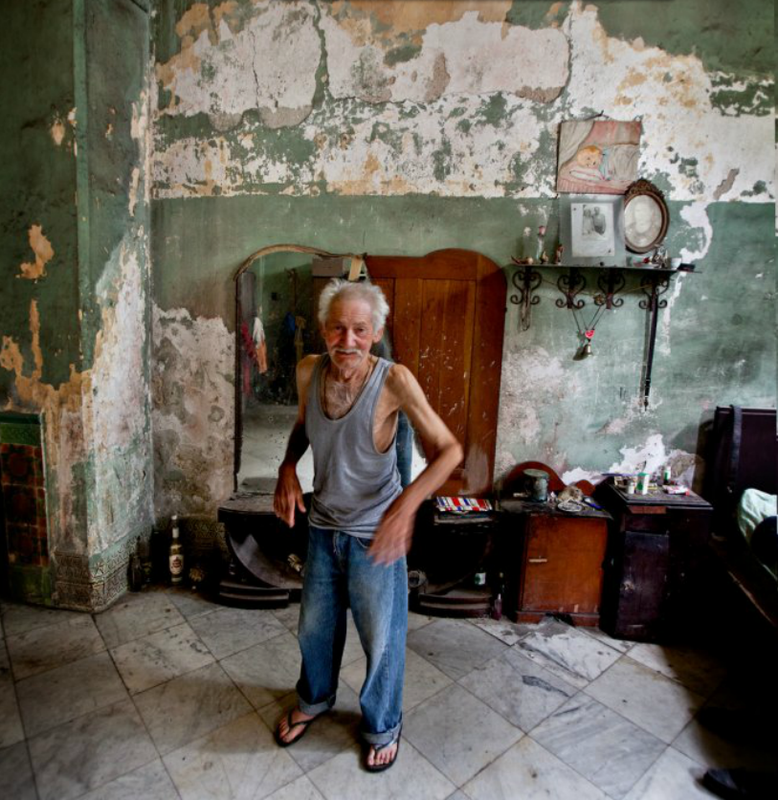 Seldin pointed to an image of an aged communist party member who lives with seven other family members in a squalid apartment with decaying walls, cracking marbled floor, and luxurious high ceiling, hearkening back to the days before the revolution that froze Havana in time. Seldin displayed about a dozen or so photographs capturing life in Cuba in sweeping documentary style shots. 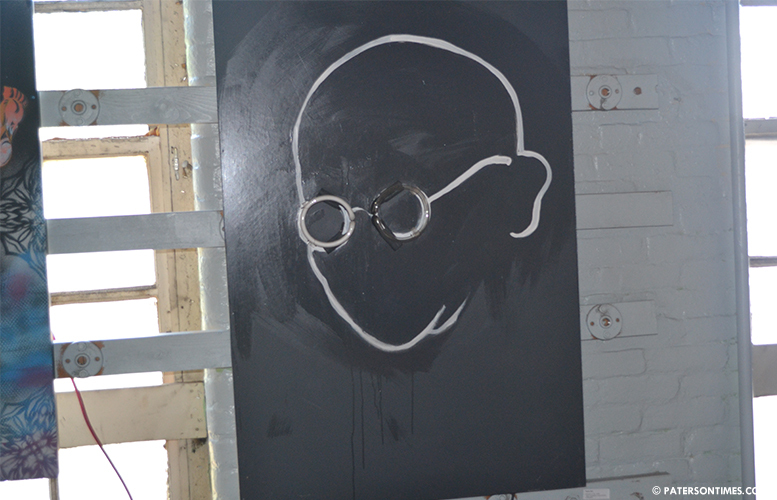 Tania Sen’s neon Mahatma Gandhi. Tania Sen’s neon Rabindranath Tagore. Another artist, Tania Sen, who has been exhibiting her work in New York and New Delhi in India, had an exhibition best described as contemporary art with a touch of neon. Sen had two busts, one of Mahatma Gandhi with neon eyeglass frame front, and another of Rabindranath Tagore, an Indian noble prize winning poet, with neon beard. 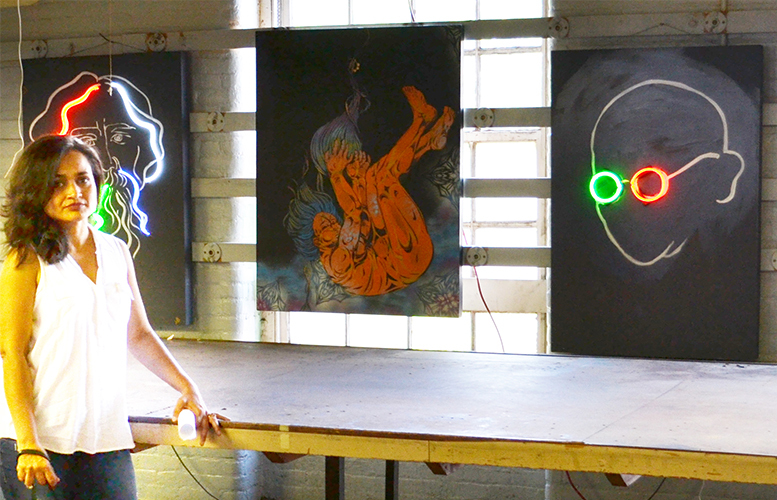 Tania Sen with lit up neon artworks in the background. Someone who has never seen an image of Gandhi would think it’s a bald silhouette, said Sen. “It’s what you’re prepare to understand or what taints or colors your understanding,” said Sen describing her work. Donita Garsia, organizer of the event at the former mill, estimated 700 exhibits at the factory. Garsia said last year roughly 6,000 visitors passed through the event; she estimates 7,000 people will come out this year. Last year, the city had two Artwalks following a fracture within the art community. 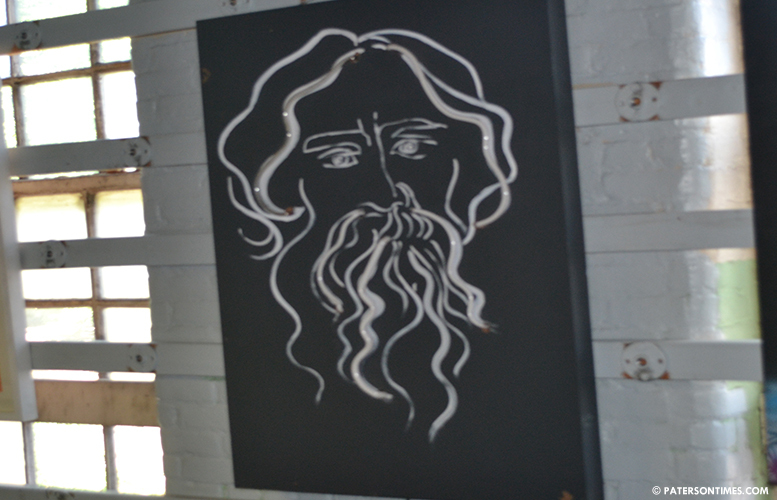 The Ivanhoe Artists Mosaic held its own event and the factory did the same. “We didn’t want a repeat of last year,” said Jim Reilly, president Mosaic. 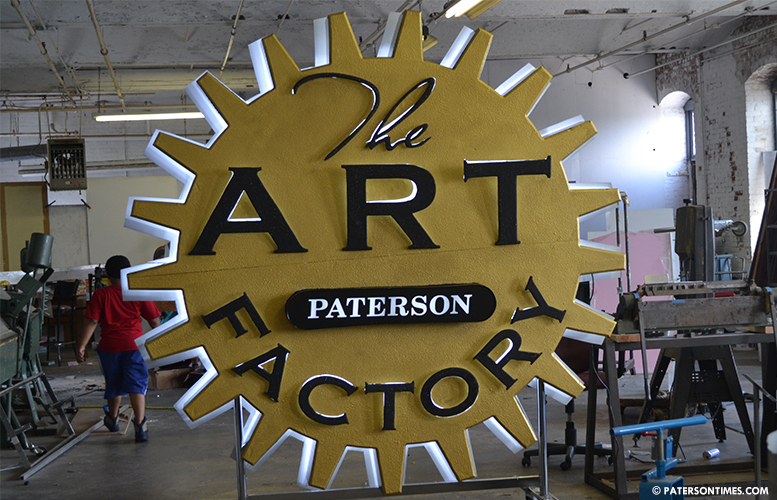 Reilly said he reached out to the factory, the Paterson Museum, and the New Jersey Community Development Corporation (NJCDC) to build cooperation between the different art organizations. This year, the unified Artwalk allowed each organization to showcase its specialty: the museum had exhibits showcasing the city’s glorious past; NJCDC held events for children; and the Ivanhoe Wheelhouse featured works of local city artists. The event began on Saturday morning and will continue from 11 a.m. to 6 p.m. on Sunday.